Okay, so my only real problem with comic books is that I’m a fast reader anyway… so comics are over really quickly and I find myself wanting more. Having been reading Marvel’s Mightiest Heroes, I found myself very quickly on the lookout for more comic books. So I was happy to find this one (and a few others) in a shop close to where I live. Although I didn’t know the events leading up to this set of comics, I still found the story easy to follow. I didn’t entirely understand Bucky’s motivations in allowing himself to get hurt… but I could see why Sam and Steve were so worried about him. I liked being able to see Bucky in a relationship with Natasha. It was good to see some of the other characters in the Marvel ‘verse… though it would have been good to see some of the other characters. 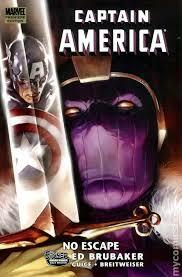 I would have liked a bit more detail on Zemo, especially since he was apparently supposed to be a good guy. I couldn’t figure out what his problem was with Bucky… even if I could understand that Bucky being an assassin might cause problems for a lot of people concerned. I did like the artwork in this comic book. It was nice to be able to see the action and tension in each of the comic book panels. I would have liked to see more of Steve and Bucky interacting generally. While I did get the feeling that Steve cared about Bucky, it would have been good to see how they would have adjusted to everything that had apparently happened. I did feel that there was a lot of obvious tension, but although I’ve only seen bits and pieces of Steve as Captain America, I felt that Bucky wasn’t as responsible. It was nice to see Bucky and Steve alongside each other in one of the scenes and I liked the fact that the others came together to try and help him. It was a bit disappointing to see people’s reactions to Bucky’s identity reveal, even if I could understand their need for answers. I have the next part in comic book format and I look forward to seeing the fallout from this.